The Mainship Type I trawler debuted in 1977 and our boat came out in 1978. This model came with a Perkins Turbo charged 160 model T6.354. A good engine to be sure and ours provided great service for many years. However late in the summer of 2006 the engine did fail and became bound. 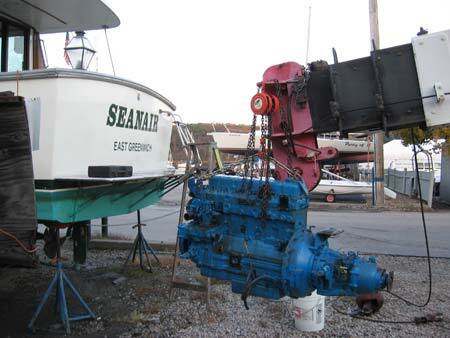 We had this engine pulled and rebuilt once years ago and so we did not want to go down that road again. Thus repowering! It was a little tough to pull apart our old friend. Looked good, but something inside had failed. I learned more about this engine pulling it apart than from working on it all the previous years. I stripped off as much as possible, mostly to reduce the size and also to sell some parts. As I kept going I began to think maybe I could just disassemble the whole thing and get it out that way. But, I guess your still left with the block, I wonder what just that weighs? All in all it came out very easy. Stripping as much off as you can seemed to help; get small! I made a vow to fess up to all the mistakes I'm going to make in this process so others might avoid them. Heres the first tip for anyone who may go through this in the future. The fellow with the crane, who did a great job by the way, offered to haul away the remains of the engine. However, part of that deal was I had to get all the oil out. No problem I figured, when the engine is out and hanging from the crane I will pull the drain plug and let it pour out. Having changed the oil many times using a small electric pump I figured this would be real easy. Well, with the day light fading and the crane operator itching to get going, I look for the drain plug and what I did find was a strange looking allen type bolt set right into the oil pan. I had every socket known to man, but no allen wrench that big or shaped that way. So, you guessed it, the operator set the engine down on a pallet next to the boat, and back I came over the weekend with my trusty electric pump and had to pump it out in 45 degree temperature; not ideal but I did get it all out. So the lesson learned was don't expect a standard drain plug like you see on a car for the engine. The tranmission, velvet drive, did have a nice drain plug and that oil came out no problem but I was left to pump the oil out of the blue monster one last time.